The first reference to a church in Stockton is during the reign of Henry I, between 1100 and 1135 (the 12th century). (So there has been a church in Stockton for about 900 years.) A gentleman named Rob de Limesi founded it. In those days, different people (lords of the manor, important families, and so on) had the right to appoint a priest for the parish. This right passed through several families until in 1824 New College, Oxford, bought it. The College still has the right to a say in the appointment of a priest in Stockton - they are known as our Patron. The original church was probably built of wood and burnt down. The rest of the alterations to the church, as we see it today, began in 1809. It is built of brown and red sandstone. * Vestry - where the priest changes into his robes - from ancient words meaning "clothes chest"
* North aisle - this is where the main door is. This is known as the "Devil's Door". A legend goes that the devil would stand by the door of a church on a Sunday waiting to see who did not attend the service. People thought that the devil could not stand outside the door in Stockton because he would be unable to endure the cold caused by the north wind. * Tower - at the West end. Before the North aisle was built, the main entrance to the church was through the tower. It is in a "Roman basilica" style. * Pulpit - the "platform" or "stage" from where the priest delivers his sermon. This pulpit is made of oak and is modern, having been installed in 1951. * Font - the base is 14th century. It holds the water used in baptisms. * Bells - there are three bells in the tower, dated 1603, 1620 and 1622. The most famous Stockton clergyman is Archdeacon Colley of Natal (South Africa). He had a glass topped coffin. At one Sunday evening service, he startled his congregation by climbing into his coffin in all his robes and was carried around the church. The reason for this was to demonstrate that he was not afraid of dying. The coffin was kept in his study and those who attended confirmation classes had to sit on it. Another of his ideas was the speakpipe. In the rectory garden there was an observatory against the wall. There was a pipe from this down to the road. The children would have to recite their lessons to him and if their answers were right, they were rewarded with apples, nuts or pennies. The Blue Lias Rings are several circular walks in south-east Warwickshire around the Stockton locality. Two of the walks go through Stockton, linking it to Napton and Southam, and to Broadwell and Leamington Hastings. The landscape here includes the windmill and old tile works at Napton, the Oxford and Grand Unions canals, the disused railway line and open farmland down to the river Leam. Leaflets showing the routes of the walks can be found in Southam Library, or obtained from Howard Collerson, Tel: 813181. The canal near Stockton rises up a set of eight locks. 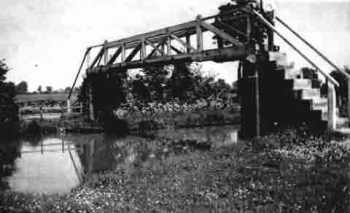 The Warwick and Napton Canal first opened in 1799 and must have brought considerable change to the locality. This became part of the Grand Union Canal in 1929. 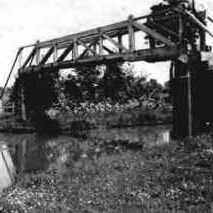 A branch was taken off the canal into the cement works for loading the cement. It is now largely filled in but can still be seen in the woods. Stockton's existence is largely due to the deposits of blue lias chalk that virtually surround the village. Now owned by Cemex, the cement works and associated quarries are no longer in use, but act as a wildlife reserve and drainage system for the surrounding land. 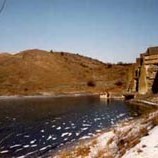 The cement works and quarries were closed in 1949, when the whole was dynamited and large quantitles of machinery thrown into the larger holes, which have since filled with water. The lakes are stocked with a variety of fish and well used by fishermen, but are extremely dangerous as rotting towers and broken machinery can cause (and have caused) injury. 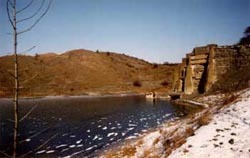 The main quarry site has been fenced since an accident there in the late 1990s. Spoil heaps and the remains of one of the loading towers. A light railway ran from the top of this tower to transport the lias rock. The water here is filled with broken up machinery and the remains of the railway.